A graduate of Wayne State University School of Medicine in Detroit, Mich., Dr. Lee completed her residency in obstetrics and gynecology at The University of Texas Medical Branch in Galveston. 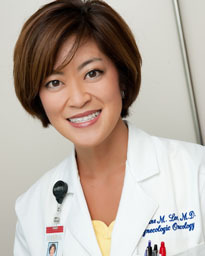 Dr. Lee completed a fellowship in gynecologic oncology at The University of Texas MD Anderson Cancer Center in Houston. While at MD Anderson, she received a master's degree in cancer biology from McGovern Medical School at UTHealth. Dr. Lee is double board certified in obstetrics and gynecology as well as gynecologic oncology. Possessing a particular interest in ovarian cancer at the molecular level, Dr. Lee was awarded an educational grant to investigate ovarian cancer and targeted gene therapy. She also has access to gynecologic oncology clinical trials for patients with recurrent/progressive cancers. She provides many highly specialized cancer treatments, including tumor debulking surgeries for ovarian cancer and complex ovarian cancer chemotherapy regimens. In addition to patient care and research activities, Dr. Lee has contributed numerous articles and abstracts that have been published in peer-reviewed journals with emphasis on endometrial and ovarian cancers. She is a member of numerous medical societies, including the Society of Gynecologic Oncology, American Society of Clinical Oncology and American College of Obstetrics and Gynecology. Practicing with Texas Oncology, Dr. Lee is affiliated with cancer services at Memorial Hermann The Woodlands Hospital and serves as the hospital's Cancer Committee Chair.